We started procuring Single Origin Coffee at Daana in early June. 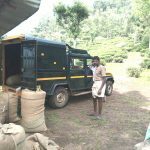 I travelled to the Nilgiris late July 2018 to meet our coffee farmers in person, and to understand better how they grow coffee, and what their challenges are. 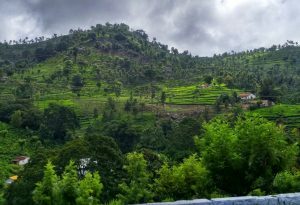 Our coffee comes from the Nilgiris region of India, where it is grown in the midst of the Nilgiri Bio-reserve, by the indigenous Irula, and Kurumba communities. Keystone foundation has been working with the tribal communities in the region for the past 25 years, in building market access for their produce, assisting with livelihoods, and helping preserve their indigenous traditions. I fell madly in love with the region, and the people. Mahatma Gandhi once said that India lives in her villages. The further you move from the cities, the more palpable is her spirit. I landed up in Kothagiri, after an hours drive from Coimbatore. 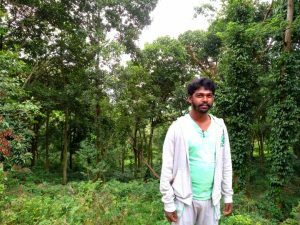 I was greeted by Jestin, who works for Adhimalai Pazhangudiyinar Producer Company, which is a tribal farmer owned collective that sells the produce of the indigenous people of the Nilgiris. The word “pazhangudiyinar” means “ancient dwellers” in Tamil. The company was formed in 2013, under the umbrella of the Keystone foundation. Today, it comprises of about 1600 members, procuring and processing over 30 tons of foraged and cultivated produce, with a catalogue of over 50 products. Along with Jestin, and Krishna, we set out to go meet our farmers. Jestin had arranged for a jeep to take us around, and asked me to leave the car behind. Only a rugged jeep could manage the terrain in these regions. Family and friends know my penchant for jeeps and hilly terrains. I happily jumped into the front of the jeep and we went along. At the edge of the town, Jestin suggested that we have lunch at a local eatery, as we would not get “city food” once we went into the forest. I harrumphed the very thought, saying that I was saving my appetite for some locally foraged food, and was bidding adieu to the town until our visit was completed. We were soon in the midst of dense forested area. Many of the tribal people have land that is on the periphery of the forest. They live in their traditional lifestyle in this remote, wild and gorgeous land. There is minimal electricity, no TV, no internet. Cellular signals are impossible. In the midst of the forest and its people, I did not feel the need for these gizmos either. We were trying to find Kannan, who works in the conservation projects with Keystone. 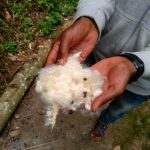 Being an Irula himself, he has an organic farm where he coaches and mentors other tribals to increase the gamut of their produce to be able to bring them to market. We drove up to his farm, got down and started yelling for him (remember, there’s no way to call someone by phone). Truth be told, his farm looks nothing like the ones we are familiar with. It is more like a patch of forest. Kannan, our treasure trove of information. Kannan gave us an overview of the region, of the families who live there and grow coffee in the forested land. Keystone foundation has been working with tribal families in establishing and improving livelihoods, and to ensure that their traditional ways find respect, and their produce find a fair market. Most of the tribal people in the region bring their produce to be purchased at Adhimalai, from where it is picked up by Daana. Both Arabica and Robusta varieties of coffee are grown in the area. 25 years ago, the tribal communities started growing coffee in the thickness of their forested lands. Keystone foundation provided them with saplings. Now, they are well established perennials, and have become part of the forest. 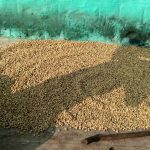 Apart from coffee, farmers also grow millets. 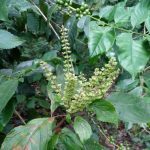 In addition, they harvest forest honey, berries, shikakai, silk cotton, and spices (pepper and wild basil are particularly favourite intercrops with coffee). They do not cultivate any crops. All of their crops are grown, in the wild, on the forest floor. Abundant biodiversity ensures there are no pests. The forest floor is supremely nourishing to the plants, any thought of fertilising inputs is laughable. So is irrigation. The monsoons feed the forests, and the rest of the times, the plants and trees do without any water. 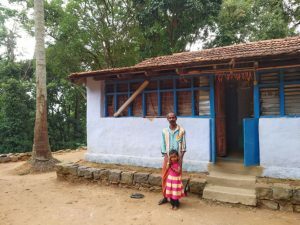 Soundararaj with his daughter, outside their home. Kannan took us to his cousin Soundararaj’s house. He is one of the farmers who sells his coffee to Adhimalai. He was talking about what all he grows, he showed us the composting pit that he was building, to use compost as a top feed for some of the coffee saplings until they establish as proper perennials, and also to apply on some of his vegetable beds. His biggest challenge in the farm is wild animals. He was showing tracts where elephants had trampled upon his plants couple of days earlier. Soundararaj’s daughter, Devisa, “smiling” for the camera. 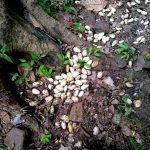 We were walking down the path around his farm, where I spotted a big lump of jackfruit seeds. A kilo at the minimum. I asked if it was because some fruit had fallen and dried up. Soundararaj says, “no amma, a bear came the previous night and ate a bunch of jackfruit”. He says he has stopped growing the Robusta variety of coffee and grows only Arabica. 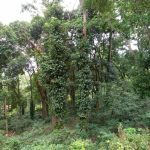 When asked why, he says: Robusta plants are taller, the wild animals hide easily behind them and can’t be spotted. They are a big hazard when walking down the farm. Many of the farmers cannot afford fencing, and hence have to take a lot of precautions. For the most part, the animals leave them alone. But elephants can be dangerous animals. Their mood cannot be predicted, and if they make up their mind that you are a threat, they will not give up on chasing you. We walked further down the jungle path. I spot coffee growing in the thick bushes of the forest. I wonder how the locals pick the beans. Kannan explains that they slash their way around with a sickle into the brush. Wild animals, snakes and such are to be braved while doing this work. But the tribal folk will have it no other way. They are convinced that they co-habit this land with all other creatures and everyone is a part of the whole. Coffee amidst Silk Cotton, Jackfruit and Pepper. 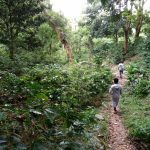 Walking amongst thick brush with coffee bushes amidst it. We then proceeded to Adhimalai’s collection centre. It isn’t coffee harvesting season. 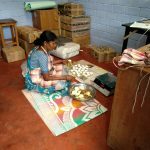 The women of the surrounding villages have organised themselves as Self Help Groups (SHGs) and are currently bottling honey, making candles from beeswax, balms, and mattresses from the silk cotton. 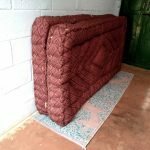 Mattresses made of silk cotton. Chithra and Swathi at the SHG. Tangy stew of greens and jackfruit seeds. Seeni-milagai being dried at the processing centre. All that walking and hiking had worked up an appetite. We walked into the centre declaring that we were ravenous. Chithra-akka and Swathi-akka had been informed of our arrival. 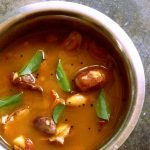 They had made a tangy stew, called “kozhambu” of wild greens, tomatoes and jackfruit seeds. They use a little bit of lentils which they purchase from the market once in a while. They served the kozhambu with rice. I realised that the rice was made specially for me, the urban visitor. Rice is unheard of in this area. The locals eat millets. I wolfed down the delicious meal. I hadn’t had jackfruit kozhambu in decades (it was a delicacy when I was a kid). 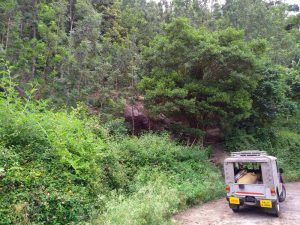 Jestin and Krishna hauled a couple of silk cotton mattresses that the women had made, to be shipped to Hyderabad 🙂 We then drove back in beautiful monsoon rain from Bhangalapudi to Kothagiri. After the sweltering heat of Chennai, monsoon rains in the hills were an absolute thrill. We got off at the Keystone office in Kothagiri. I picked up some coffee that Krishna had roasted and powdered for me, handmade soaps and balms. It had been a long day for all of us. We spent a few minutes sipping coffee at the Keystone canteen (they have an organic vegetable garden that supplies the to the canteen) and heavy heartedly said our byes. 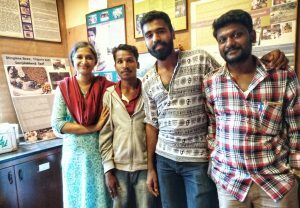 They had taken the entire day out for me (which means coming back to a full day’s worth of backlog the next morning) and showered me, a rank stranger, with their love and affection. I went back to my car, and left for the plains, promising myself that I will be back here during harvest time. I look forward to updating this section with a trip report part deux. The tribal people hand pick the berries. The berries aren’t harvested en-masse. Just the ripe ones are removed. This process happens over a period of weeks. Leaving the berries to ripen fully on the plant until harvest ensures peak flavour in the beans. They then use a small pulping machine to remove the beans from inside the berry. 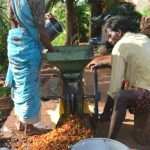 Keystone foundation has setup pulping machines in each village, to make it easier for the families to bring in small batches multiple times. 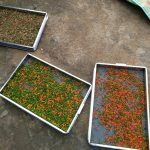 The seeds are then air dried on the patio of their homes. Once dried, they deliver these to Aadhimalai, where the producer co-op weighs them and pays them for their produce. Coffee pulping in the village. Drying of the beans post pulping. Daana purchases these beans from the Aadhimalai co-operative, and has them roasted in small, weekly batches, at Uday & Sujatha’s roastery in Hyderabad. The beans are roasted to a medium dark roast, and then powdered for a ground coffee offering. Roasted beans are also packed as such for folks who wish to buy the beans. The beans are roasted and de-carbonised for 48 hours, after which they are packed. We use only fully recyclable and bio-degradable packaging for our products. Which is why you will not find our products packed in composite sheets with valves, as you will commonly find in other gourmet brands. To us, gourmet and responsibility go hand in hand, we compromise on neither. Read more about our packaging here. Indian coffee surprisingly has not garnered any international mindshare around gourmet coffee. As you can gather from the information above, and after tasting our coffee, you will realise that this region has some of the finest, and most sustainable coffee one can find in the world. 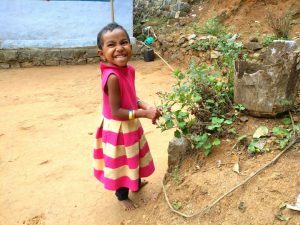 The Irula, Kurumba, Toda and other tribes of the Nilgiris live in remote jungles, deeply rooted in the traditional ways of their ancestors. This is the secret ingredient in the coffee. It is our aspiration and honour to be able to bring their coffee to the world.